A top priority for emergency preparedness is water storage. Clean, safe drinking water is absolutely critical for survival. 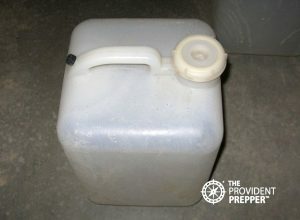 What is the best way to store water for emergencies? What containers are best for water storage? How do you treat water for long-term storage? These are each important questions to understand to ensure you have a safe supply of drinking water when disaster strikes. • What are the critical uses of water in a disaster scenario? • How much water should I store? • What are the best containers for water storage? • Does stored water ever “go bad”? • How do I treat water for long-term storage? We need water for hydration. Water is constantly being lost through respiration, perspiration, and normal elimination processes. That water must be replaced in order for our bodies to function properly. The human body requires a minimum of one quart of water per day just to sustain life. A healthier recommendation is drinking two quarts of water each day. It is important to store enough water to take care of personal hygiene and sanitation. Staying clean reduces the spread of disease, keeps our skin healthy and just makes you feel better. Washing dishes and sanitizing surfaces are especially critical when germs are abundant and immune systems are compromised. Water for medical and first aid needs is an important consideration. Water may be needed for flushing wounds or other medical procedures. It can take a lot of water to clean up after someone who is vomiting or has diarrhea. Food preparation is another use that may be overlooked when calculating water needs. Cooking with freeze-dried or dehydrated foods requires clean water for re-hydration. If you just eat these foods as is, your body will need additional fluids in order to process them appropriately. Cooking with dry grains, beans, and rice requires water to make them edible. Pets and livestock water needs must be calculated and included in your water storage plan. How much water should I store for emergencies? Expert opinions differ on the recommended amount of water people should store. FEMA recommends at least one gallon per person per day for a normally active person. Additional amounts are required for nursing mothers, children, sick people, high levels of activity, and the amount doubles during hot weather. This number takes into account two quarts for drinking and two quarts for food preparation and hygiene. Let us put this into perspective. In our area, the average use per person is about 167 gallons of water per day. Indoor usage averages 68 gallons per person per day. Reducing water consumption from 68 gallons down to 1 gallon a day requires a drastic change in lifestyle. Our personal recommendation is at least two gallons per person per day. We found it almost impossible to live off of one gallon per day. Perhaps if your food supply is made up of canned goods, which require no additional water, if you are leading a sedentary life indoors, and if no one gets sick or injured you may be able to get by on one gallon a day. Remember that good hydration is critical for a healthy body. Two gallons per person per day is a realistic water storage goal. 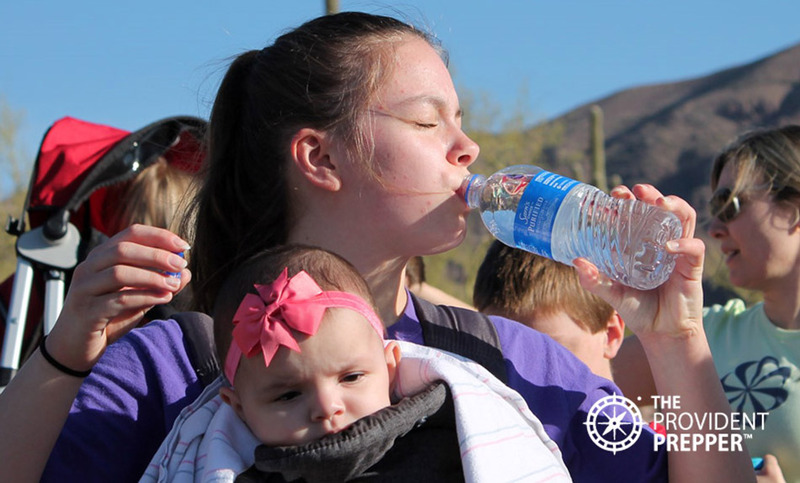 One gallon of drinking water per day is a safer estimate, particularly when considering that many disasters create an environment requiring heavy physical labor or exposure to the elements. When the need arises, if you find you can get by with less water, you will be able to make your water supply last a little longer. Pets should also be calculated in your basic water storage requirements. Be sure to plan for enough water to take care of your furry little friends. 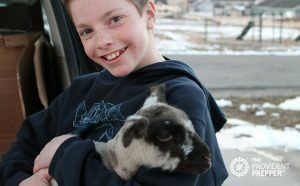 We personally have chickens, guineas and cats that need our consideration. The next part of this equation is how long do you need your water supply to last? Is your goal for two weeks in order to survive a hurricane or earthquake? Perhaps you are preparing for an extended grid down event where you may be without water for several months. 6 people x 2 gallons x 14 days = 168 gallons. Three 55 gallon drums and a few cases of water bottles will take care of the basic water needs of 6 people for two weeks. 2 people x 2 gallons x 14 days = 56 gallons. One 55 gallon drum and a case of water bottles cover the basics. 1 person x 2 gallons x 30 days and 1 large dog (2 quarts a day) = 75 gallons. One 55 gallon barrel, 30 re-purposed 2-liter soda bottles and a few cases of bottled water would meet the basic needs of one person for a month. 5 people x 2 gallons x 90 days and 1 cat (1 cup per day) = 906 gallons. Two 275 gallon totes, six 55 gallon barrels, four 5 gallon water containers, 30 re-purposed 2-liter soda bottles and 10 cases of commercial water bottles (average 3 gallons per case) takes care this nicely. Any combination of containers will work to achieve your goal. Remember … empty water containers do not count!! What exactly should you store your precious water in? We prefer to store water in a variety of containers. A 55-gallon barrel or tank stores a lot of water in a relatively small space. It weighs over 450 pounds, and is difficult to transport, particularly if you need to evacuate. Water bottles are inexpensive, easy to rotate and portable. Diversifying your water storage containers will ensure you have a readily available supply of water in any disaster. 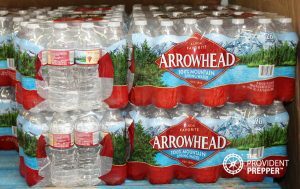 Our personal water storage includes 275 gallon totes, 55-gallon barrels, 45-gallon barrels, 15-gallon barrels, 5-gallon containers, reclaimed juice, and soda bottles, canning jars, and commercial water bottles. 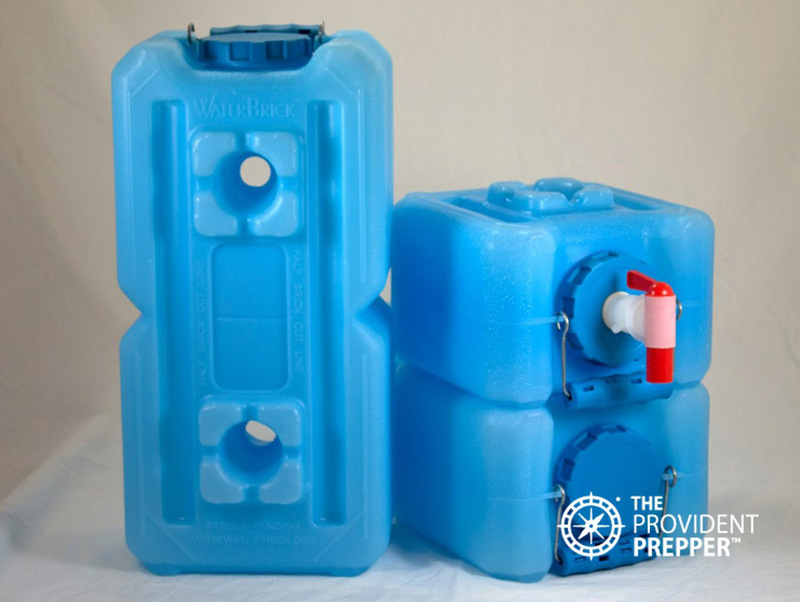 Yes, we are preppers and recognize the critical importance of water storage. The diversity in our storage containers helps us to be prepared for a variety of scenarios. Let us explore some possible water storage containers options and the materials they are made from. Glass is ideal for water storage as vapors and gases are unable to permeate the glass and contaminate the water. The glass will not break down over time and leach into the water like plastic will. However, glass is heavy and easily broken. We store water in our empty glass canning jars. The jars take up the same amount of space whether they are full or empty. The official recommendation is to use new lids and process quart jars of water in a water bath canner for 20 minutes. This method results in sterile water, free from all pathogens. Reality is, we would never make the time to do this, so our jars would remain empty. Our empty jars, lids, and rings are sterilized in the dishwasher and then filled with hot tap water. Then they take their place of honor on the shelves with the bottled fruit and vegetables. Our system is not perfect, but we have a lot more water stored because this system works for us. Plastic is lightweight and sturdy, making it a great candidate for water storage. Avoid using plastics that may leach Bisphenol A (BPA) into the water which is a known endocrine disruptor. Plastic is permeable and should never be stored near gasoline, pesticides or similar substances. Store out of direct sunlight whenever possible. Some plastics such as polyethylene terephthalate (PET or PETE) and high-density polyethylene (HDPE) are good candidates for water storage, some other plastics are not. 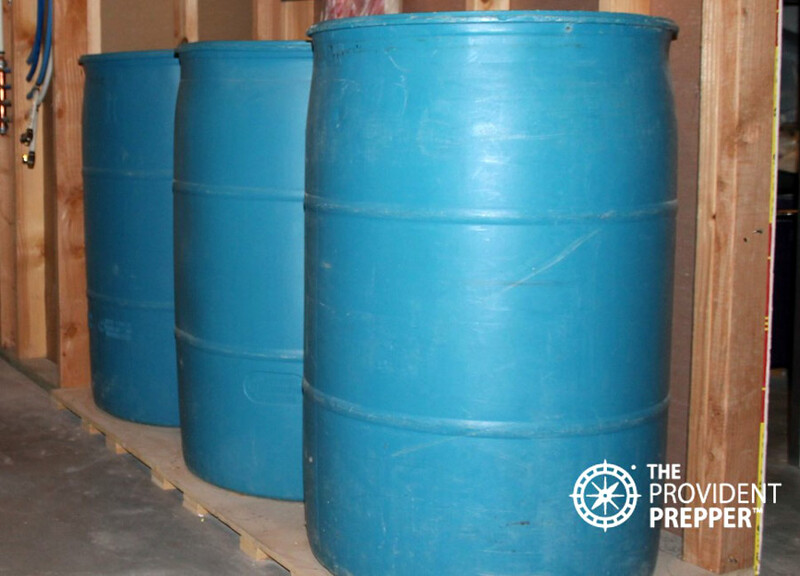 High-density polyethylene (HDPE) is the plastic commonly used in the popular blue 55-gallon water storage drums. 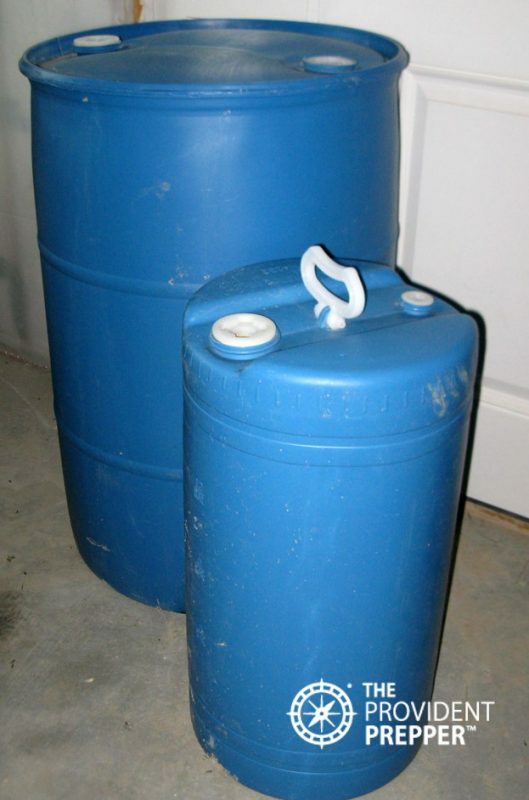 Water barrels store a large amount of water in a relatively small space and can be stored inside or outdoors. Standard water barrel measurements are 55 gallon (36” high x 24” wide), 30 gallon (30” high x 20” wide) and 15 gallon (24” high x 15” wide). These barrels usually have two bungs (plugs) at the top which can be difficult to open. A bung wrench or channel lock pliers may be required to open the plugs. Attach one of these tools to the top of a barrel so you will have it when you need it. Think about how you are going to get the water out of that large barrel. Be sure to keep a siphon or hand pump nearby to simplify access. I keep ours wrapped in plastic to keep it clean and prevent the pump from becoming contaminated. New food grade water barrels are best but come with a significantly higher price tag. It is possible to obtain used food grade water barrels for a fraction of the cost. Never re-purpose a barrel for water storage that has held anything that you would not consume. Clean all barrels well before filling for long term storage. We recommend rinsing out the barrel very well and then adding a strong chlorine solution (1 cup of bleach to 2 gallons water). We leave this solution in the barrel for a few days and let the kids roll the barrels around the yard. Contact time is important, allow a minimum of two hours of contact time. If the barrel contained a sticky or oily substance, we add a little bit of dish soap. We then rinse the barrel and repeat the process until we feel comfortable with the cleanliness of the barrel. Some of our water still has a faint odor of lemon-lime syrup from its original contents, which continues to fade with each rotation. We plan to use this water for hygiene or we will filter it before drinking. However, if we had to drink it as it is, there is nothing in that water which can harm us. 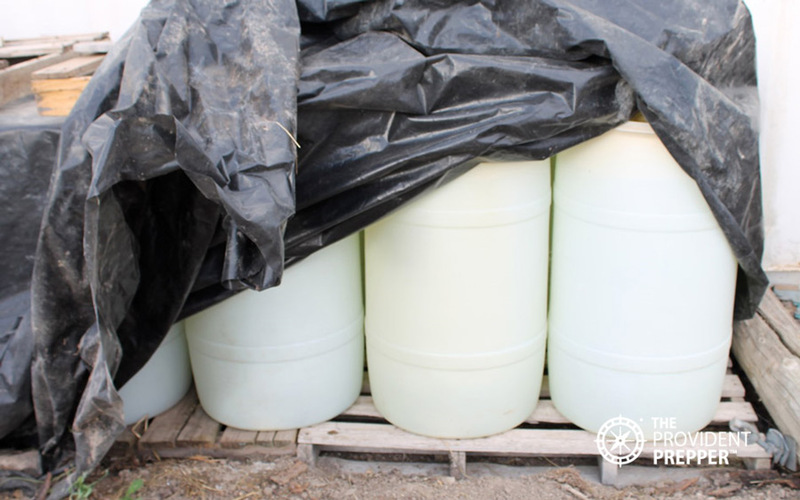 Water barrels stored outside should have plenty of head space to allow for freezing and be protected from direct sun, which will break down the plastic and can promote algae growth. A heavy dark tarp will help protect the barrels from light. 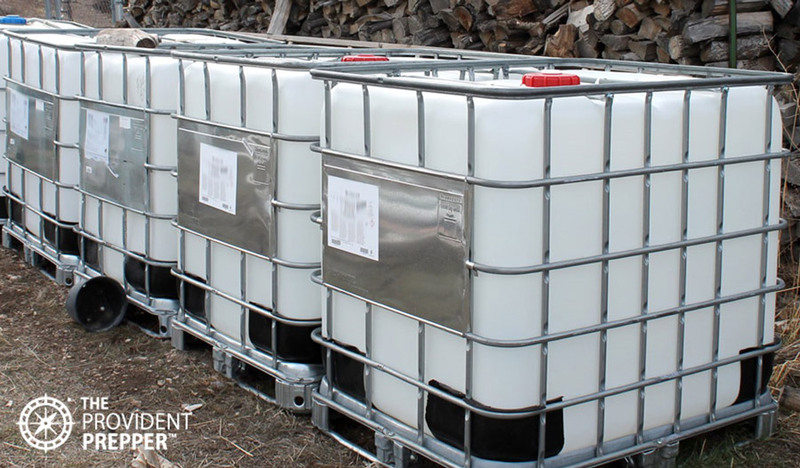 It is best to store water barrels off the ground on sturdy pallets or wooden planks. These sturdy plastic bricks come in 1.6 and 3.5-gallon containers. WaterBricks offer an optional spigot which allows for convenient water dispensing. The WaterBrick design is unique and allows the containers to be stacked like interlocking bricks. They are heavy duty with a handle for easy transportation. Water containers with sturdy wheels and a pull handle can facilitate transportation of larger amounts of water than can be carried. Water stored in these wheeled water tanks may be a great asset in the event you need to evacuate. They can be transported and easily refilled for continued use. 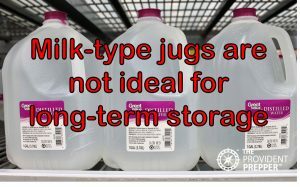 Water may be purchased commercially in “milk jug” type containers, but are not recommended for long-term storage as they will leak over time. 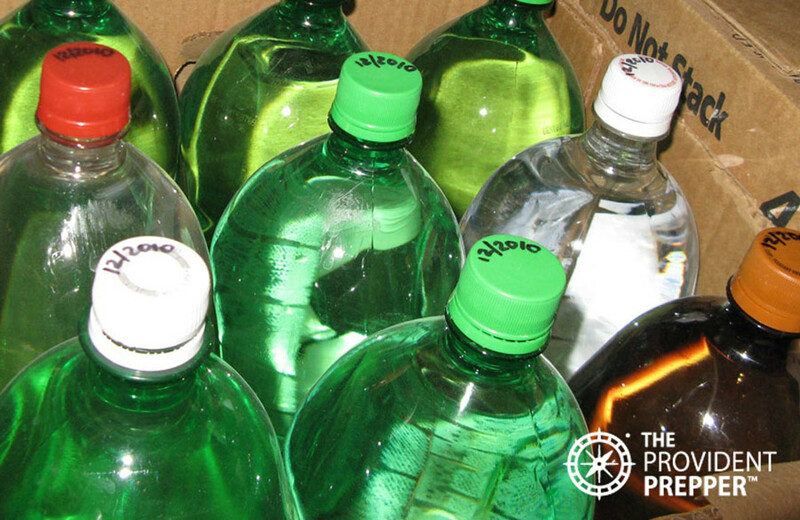 Water damage is a mess to deal with, so don’t store these bottles for more than one year. 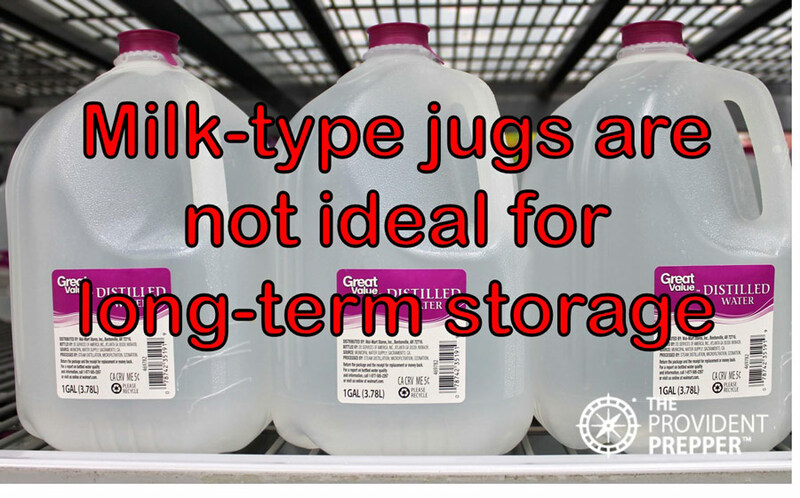 Purchase thick plastic water bottles instead of the milk carton type jugs for long-term storage. Buy bottles in higher quality packaging for long-term storage instead of the thin disposable varieties. Cases of water bottles can be stacked several high without damaging the bottles. Commercial water jugs and bottles are convenient and easy to rotate regularly. Some water bottles will develop a foul odor and taste when stored in the heat. Store in a cool, dark location to extend the shelf life of bottled water. Never store water in used milk cartons as they are engineered to degrade and will leak. There are frequently traces of bacteria left from the milk which are difficult to completely remove creating a risk of bacterial growth in the stored water. Used PET/PETE soda or juice bottles are great options for inexpensive water storage. They are made of thick food grade plastic and are ideal for storing water. We have never had any problems storing water in these bottles. We rotated ours the last time that we moved after being in storage for 10 years. The water was absolutely fine. Soda and juice bottles should be cleaned thoroughly to prevent any bacterial growth during storage. Thoroughly rinse the bottles, then disinfect with a strong chlorine bleach solution. I use about one tablespoon of bleach in a two-quart bottle. Remove and discard lid inserts and soak lids in a bleach solution. Allow bottle and lid time to air dry, then fill with clean water and store in a cool, dark location. Empty bleach bottles used to be quite popular containers for water storage. Never use any container for drinking water storage which has contained anything that you would not drink. I don’t drink bleach so I don’t store water in used bleach bottles. 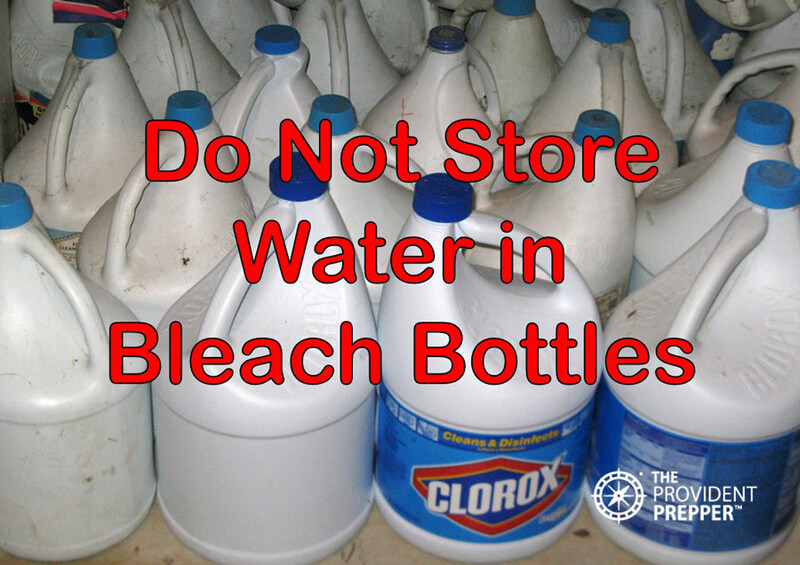 If you have your heart set on recycling bleach bottles for water storage, use the water for hygiene purposes only. Mylar water storage bags are metalized plastic bags stored in cardboard boxes. They are available in five-gallon bags equipped with a plastic spout and fit into a sturdy cardboard box. The boxes can be stacked up to three high. Care should be used when filling the bags to keep the cardboard dry. Water storage tanks are available in a variety of sizes in above and below ground systems. They store a huge amount of water in a relatively small area. Some above ground tanks are designed to be stored in a garage or basement and take up very little floor space compared to water barrels and may be safe from freezing in a garage. Underground water storage tanks are perfect for operational security. Out of sight, out of mind. The initial investment for a large underground water storage tank can be significant, but the return may be worth it if it works with your budget and location. Stainless steel is an extremely durable option for storing water. Large stainless steel cisterns are an alloy containing chromium which increases resistance to corrosion. These tanks will last for 50 years or so. Avoid treating water in a stainless steel container with chlorine as it breaks down the ‘passive layer’ on the surface which keeps the steel from rusting. Stainless steel tanks are great for harvesting rainwater. Note that it is possible for the water to pick up a metallic taste. Large cisterns can be purchased in galvanized steel. The interior of the tank is painted with an epoxy lining that provides a protective barrier between the water and the metal, preventing rust. They have a lifespan of 30-35 years. Swimming pool water should not be depended upon for your sole source of water storage. Think of it as a bonus backup. Pool water is at risk for all types of environmental contamination. The chemicals used to disinfect the pool water make it unsafe to drink. Purchase a high-quality filter capable of removing chemical contaminants and filter before consuming if you plan to drink pool water. I would only drink pool water after distilling it, due to the high concentration of chemicals. Disinfecting or boiling pool water will not make it safe to drink. Early warning of an impending threat may allow you time to stock up on fresh water supplies. At the first sign of trouble, such as a hurricane warning, fill bathtubs, pitchers, pots, pans, containers, and buckets with water. Turn off your main water valve to protect the clean water already in your system (pipes, water heater, etc.). Emergency bathtub liners are a good idea for expedient water storage. They take up very little room and can be filled quickly. The liners will hold up to 100 gallons of drinking water depending on the size of the tub and brand. We are frequently asked if stored water ever “goes bad.” Water is a stable compound of hydrogen and oxygen. If clean, treated water is stored appropriately in clean, food-grade containers, there is not much that can go wrong. Water can be affected by environmental conditions. Factors which play into the shelf life of water include: original quality of water, light, temperature, and the storage container. Inspect your water supply periodically and check for changes in appearance, odor, taste, and for leakage from the container. Ideal storage environment for water is a food grade container in a cool, dark area. Store away from gasoline, kerosene, paint, chemicals, pesticides and other contaminants. Leaked substances and fumes may penetrate the container and contaminate the water. Rotating water can be challenging. The official recommendation for water rotation is every six months to a year. This may not be practical or necessary. 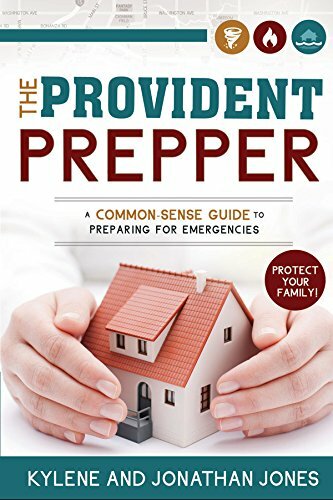 In the real world, even the best preppers are going to find it a challenge to keep water rotated frequently. Make it a practice to check water storage containers periodically. If the water has changed in appearance or smell, rotate it. We recommend that you be prepared to filter your water through a quality filter if you do not rotate it regularly. Clean, food grade containers and clean drinking water should be used for long-term water storage. You may choose to disinfect the water at the time of storage to ensure there are no microscopic bugs in the water that could multiply during storage. However, if it is a clean container and a clean, chlorinated municipal water supply it may not be necessary. New food grade containers are best but come with a significantly higher price tag. We use a lot of food grade re-purposed containers to make our water storage more affordable. Never use containers that have held anything you would not consume. It is important to avoid introducing contaminants when you fill your water containers. 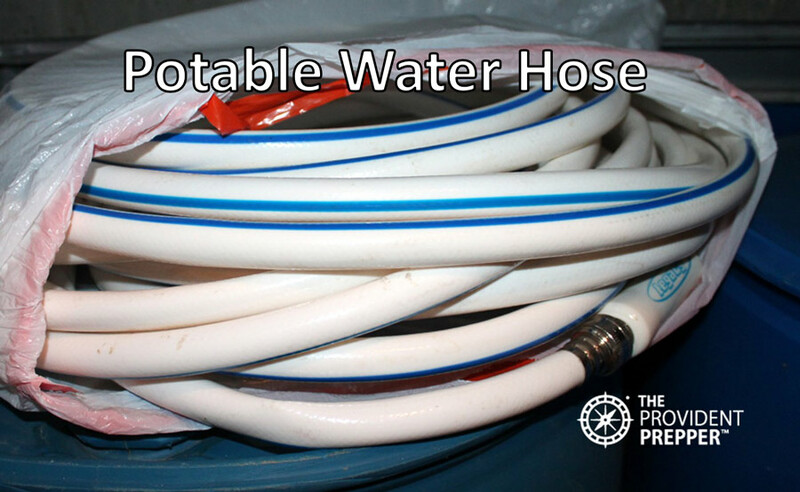 We recommend using a potable water hose (generally used for filling recreational vehicles and water tanks). 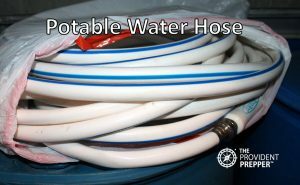 Store the potable water hose with the ends connected together to prevent contamination during storage. Accessing water from a 55-gallon barrel may require a siphon or pump. Be sure to protect these tools from contamination by storing the pump in the original packaging or wrapping in plastic. The last thing you want to worry about in a water scarce environment is how to sterilize your water pump. Titan Ready makes a handy water storage system that stores two 55-gallon water barrels on a rack on their sides for easy use and refilling. It would be a good idea to store a bung wrench, channel-lock pliers, or other appropriate tools needed to open containers. The plugs on plastic barrels can be difficult to open without proper tools. We do not like to add unnecessary chemicals to our water. If the water source is from a chlorinated municipal supply, it may not be necessary to add more chlorine. Sometimes we treat, and other times we do not. It depends on how we feel about the container, water source, and techniques used to fill the containers. Disinfecting is as simple as adding 1/8 teaspoon calcium hypochlorite or 2 tablespoons of fresh bleach to a filled 55-gallon barrel. 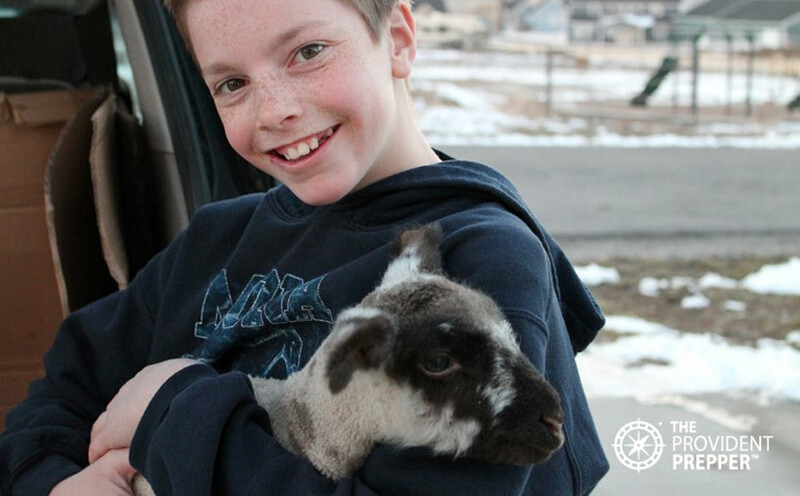 When our children help, there is a higher likelihood of environmental contamination and we choose to disinfect. If the barrels are re-purposed, we always treat the first time we fill them. You decide what you are comfortable with. If you have any concern regarding the safety of the container or the water, disinfect when filling with water. This will kill any microscopic critters who may have been hiding in the container or the water, to begin with. Remember that treating the water will not remove contaminants such as chemicals, pesticides, salt, etc. 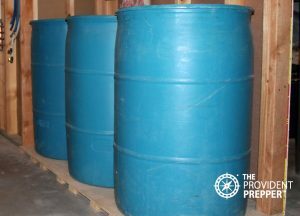 You may want to check out our post Tips for Storing Water in a 55-Gallon Plastic Barrel for more details. Chlorine is a common way to disinfect water for storage. Chlorine may accelerate the rate the plastic leaches into the water and some recommend not treating at the time of storage. I do not know what the conditions will be when I need to use the water. Will I have the time or resources to treat the water? I prefer a little leached plastic over pathogens in my water supply any day, so I choose to treat when I fill the container. Water from a chlorinated municipal supply may not need to be treated for long term storage. It has already undergone an extensive treatment process with residual chlorine in the water. However; if you are concerned at all, go ahead and disinfect the water. Chlorine will not deactivate some parasitic protozoans such as Cryptosporidium parvum and Giardia lamblia. Protozoa are large and most decent filters have the ability to remove them. They should not be a problem if the water has been obtained from a safe source. Fresh non-scented household bleach with sodium hypochlorite (5.25%-6%) as the only active ingredient may be used to disinfect water. The bleach should not have any added scents, thickeners, etc. Chlorine bleach has a usable shelf life of only 6 months. The chlorine content decreases as it ages so be sure that you only use fresh bleach. 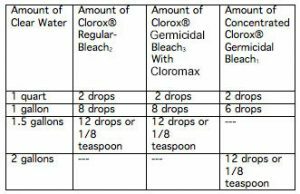 I contacted Clorox in August of 2018 and these are the official recommendations from the company along with the table and how much to use of each of the approved varieties of bleach. Prior to addition of the bleach, it’s important to remove all suspended material from collected water by letting it settle to the bottom or by filtration. This means that after you collect some water that hasn’t been treated, you need to let it sit long enough to let any debris settle to the bottom of the container. Next, decant the clarified contaminated water into a clean container, then add the bleach. Use the following table to determine how much bleach to add — it depends on how much water you are treating. Allow the treated water to stand for 30 minutes. 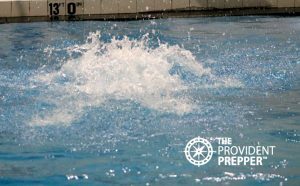 Properly treated water should have a slight chlorine odor. If there’s no chlorine odor, then you need to repeat the treatment. Just add the same amount of bleach, and wait for another 15 minutes. Check again for the chlorine odor before drinking the water. If bleach taste is too strong, pour cleaned water between clean containers several times and let it stand for a few hours before use. 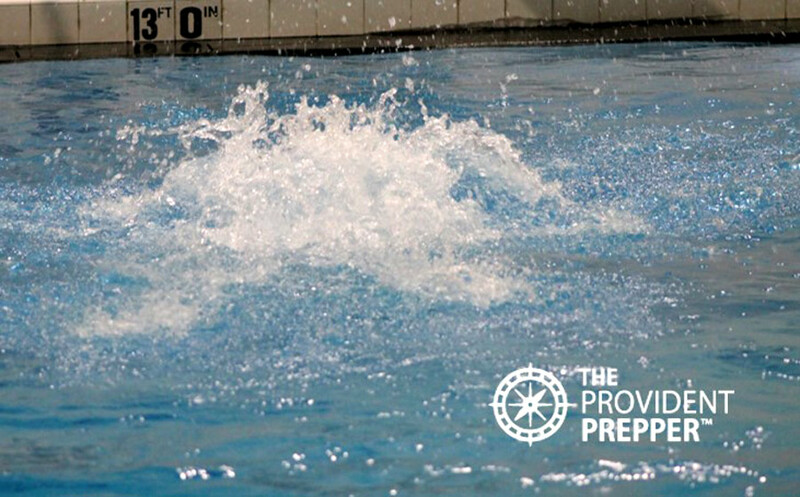 A student recently asked us about a product called Water Preserver Concentrate. I promised him that I would research the product and these are the results of my investigation. One bottle of Water Preserver Concentrate retails for about $15 and treats one 55-gallon drum of water. The Safety Data Sheet lists the active ingredient as 5.25% sodium hypochlorite which is the same active ingredient in bleach. 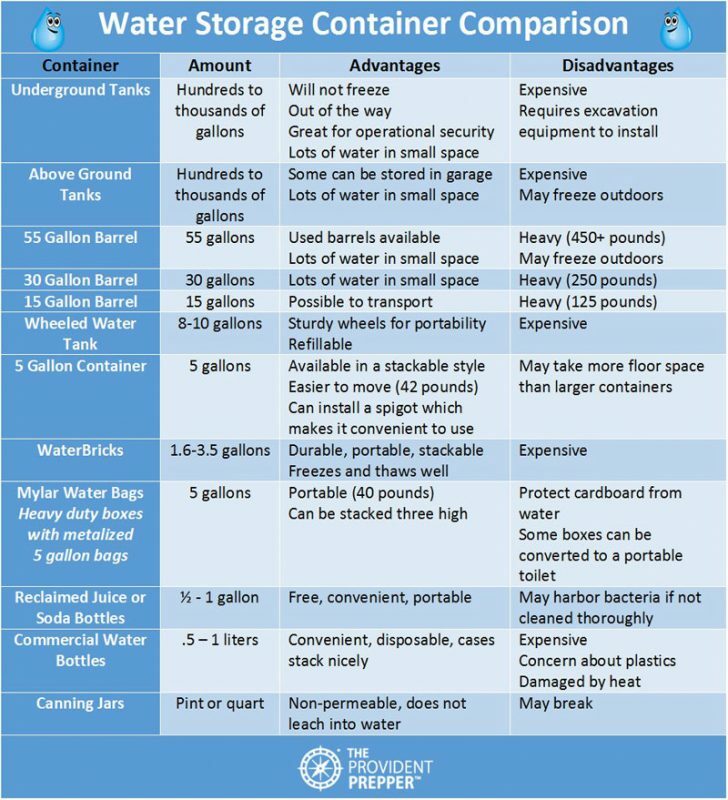 The study referenced on WaterPreserver.com compares stored water treated with Water Preserver to stored untreated tap water. I would have been impressed if the study compared their product to other forms of long term water storage disinfection techniques. We would expect untreated tap water to have biological pathogens in it. That is why we disinfect it. Sodium hypochlorite loses strength with the passage of time and has a short shelf life. Water Preserver Concentrate must be added to the water before the expiration date on the bottle. Chlorine bleach has the same issue. They are not good candidates to store on the shelf for future water storage disinfection. My humble conclusion is that this Water Preserver Concentrate works just fine for disinfecting a 55-gallon drum of water. It is a bit pricey, but it does come in a pre-measured container that takes the guesswork out of disinfecting water in a 55-gallon barrel. 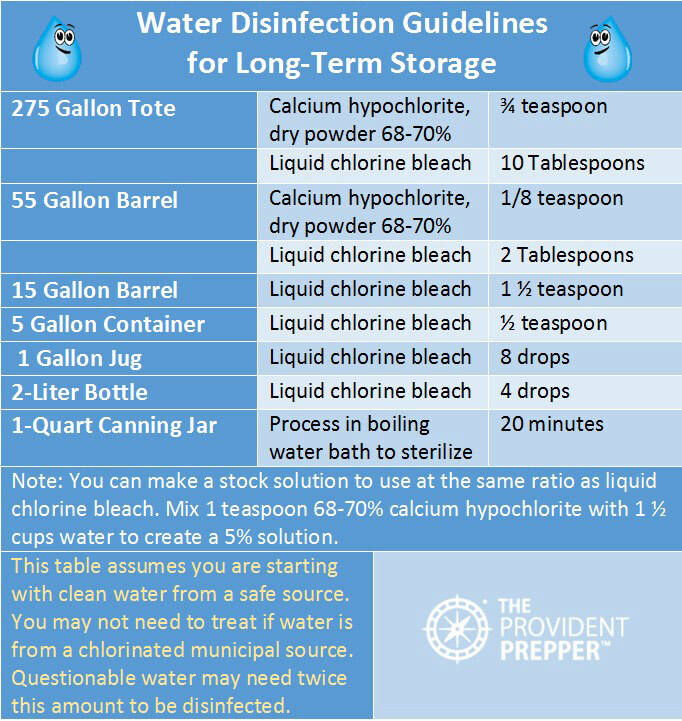 We treat our water for storage using the guidelines on the table below. 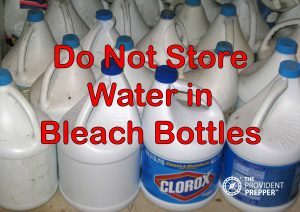 Use the lowest recommended amount of bleach if the water is clear and from a trusted source. Treat with the larger amount if the water is cloudy or questionable. If you are concerned about the safety of the water, wait 24 hours after treating then smell the water. The water should have a slight residual chlorine scent. If not, repeat the treatment. Calcium hypochlorite is my preferred method for treating larger amounts of water for long-term storage. It is simple and does not add unnecessary chemicals to the water. Just fill a 55-gallon barrel and add 1/8-1/4 teaspoon of dry calcium hypochlorite to the water of a 55-gallon barrel or make a chlorine stock solution from calcium hypochlorite and use at the same rate as bleach. Calcium hypochlorite is inexpensive and has a 10-year shelf life. See our post Disinfecting Water Using Calcium Hypochlorite for details on how to make a stock solution for treating smaller amounts of water. An extremely effective way to store water is to fill quart canning jars with clean water and process them in a boiling water bath for 20 minutes. Glass is non-permeable and does a fantastic job of protecting the contents. Water bath canning creates sterile water which may come in very handy for medical procedures or to make infant formula. Storing water enables you to have access to clean drinking water regardless of the time of day or outside conditions. Water is heavy which makes transporting it difficult. One gentleman explained that he lived across from a river and did not need to store water. If he needs water, he will just gather some and filter it as needed. Think this through with us. 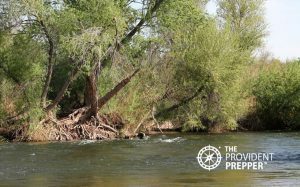 What if the need for water occurs in the dead of winter when the river is frozen or when accessing the water through snow and ice may be dangerous? What if there is a HAZMAT spill causing chemical contamination of the water? How about a nuclear event contaminating the water with radioactive particles? What if he needs to shelter-in-place and or it is dangerous to leave the safety of his home? If you are concerned about the taste or safety of your stored water, plan to filter it before drinking. Stored water can be easily passed through a quality filter to ensure safety and improve the taste. The most important thing is to store the water! Properly stored water will always be safer than anything you can get from local water sources after a disaster. We have prepared a worksheet to simplify the process. You can find it here. 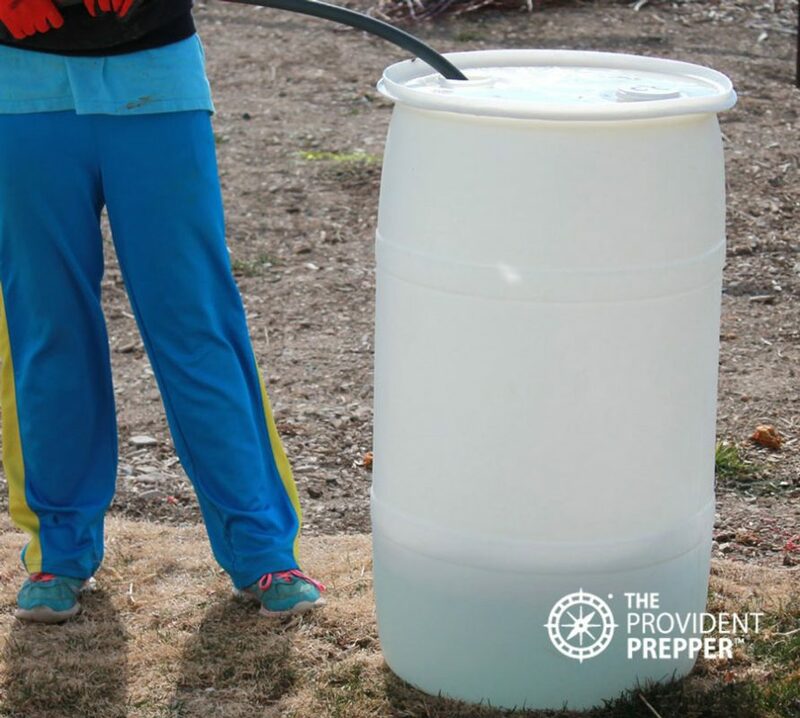 Water storage is critically important in your preparedness efforts. It is relatively inexpensive and easy to accomplish with a little creativity. No more excuses.